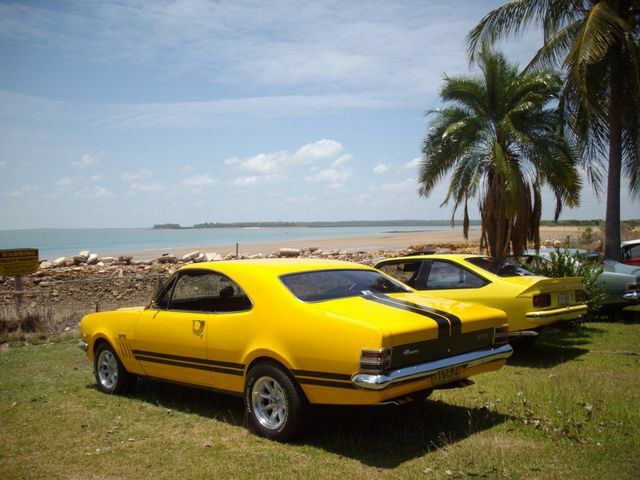 Classic Holden Car Club NT Inc. 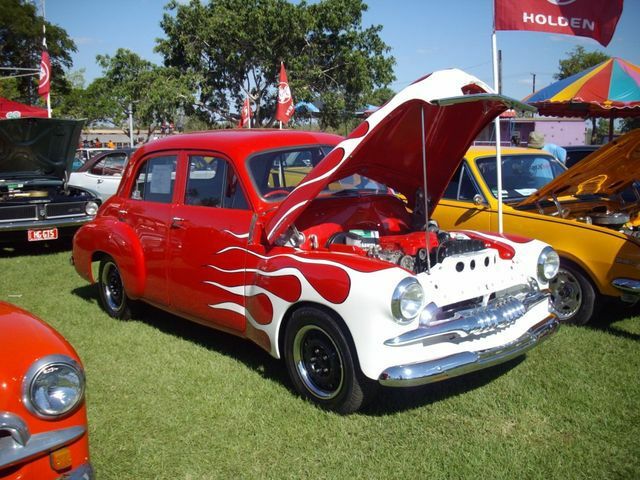 The Classic Holden Car Club NT host a variety of runs throughout the year that appeal to different members, we try to cater to all. 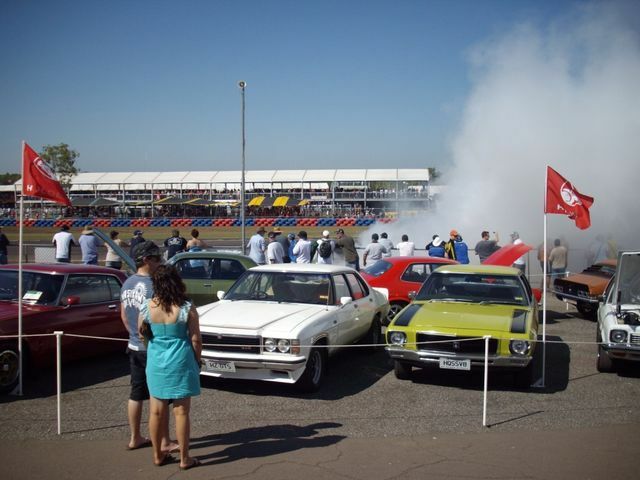 From car shows to family social outings there is something for everyone's taste. With the exception of December we have at least one function per month (generally held on the 3rd Sunday), but during our peak period in the Dry Season we can have something on every weekend. General meetings are held on the 2nd Tuesday of the month and members are welcome and encouraged to participate, please phone for times and venue details. 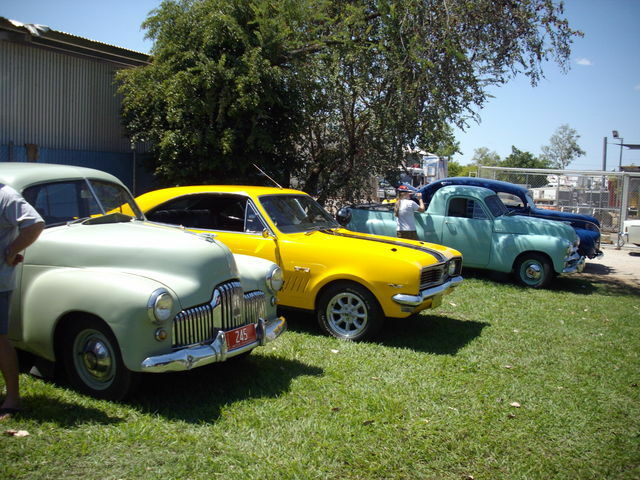 This event is organised by CHCC member John Obolevics and his partner Trish Creedon and attracts over 600 vehicles. 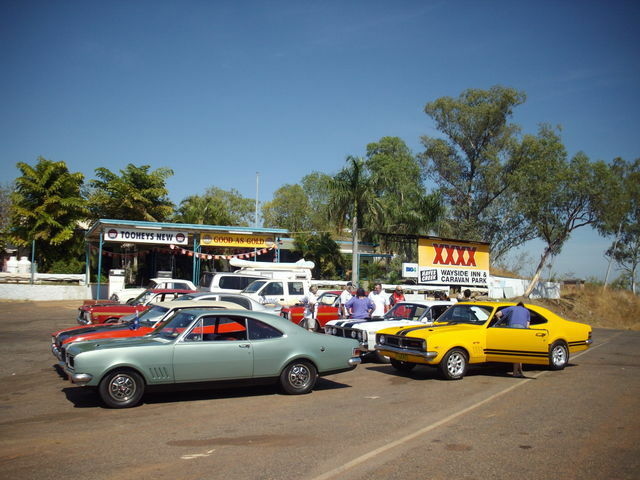 Traditionally we meet up at Hidden Valley Raceway, there's a slow lap of the circuit followed by a cruise through town with heaps of spectators along the route to cheer everyone on. 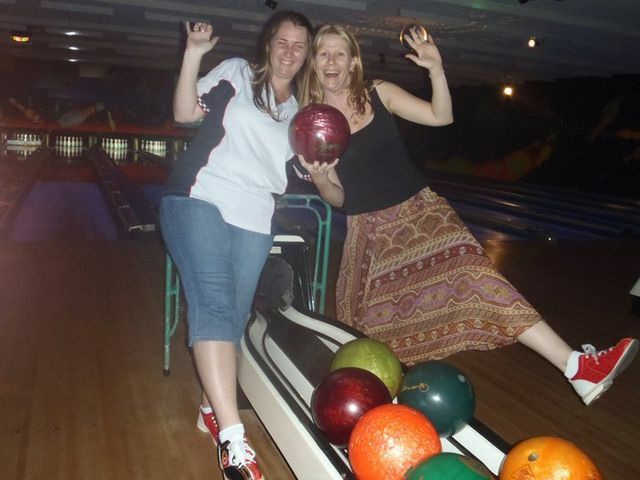 The cruise finishes at the Greyhound track in Winnellie and this is where the fun begins. 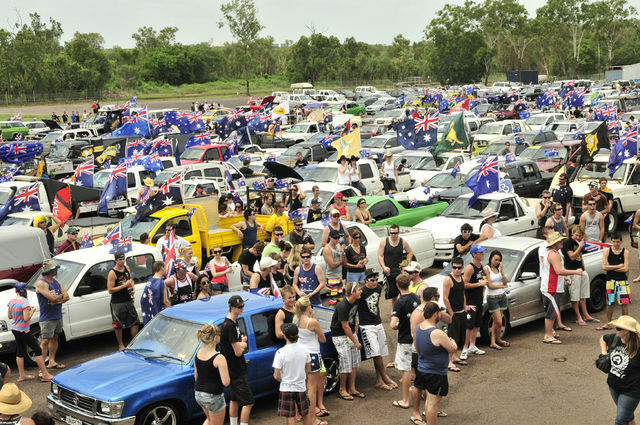 Celebrating everything Aussie there's the muffler trowing, thong throwing and push a ute competitions as well as heaps of activities for the kids. There are heaps of prizes up for grabs as well, best ute, best themed best original, best modified and heaps more 'classes' there's also the best dressed person and best dressed dog. Generally the Club helps out by manning a food stall or presiding over the competitions. All proceeds go to "Variety". 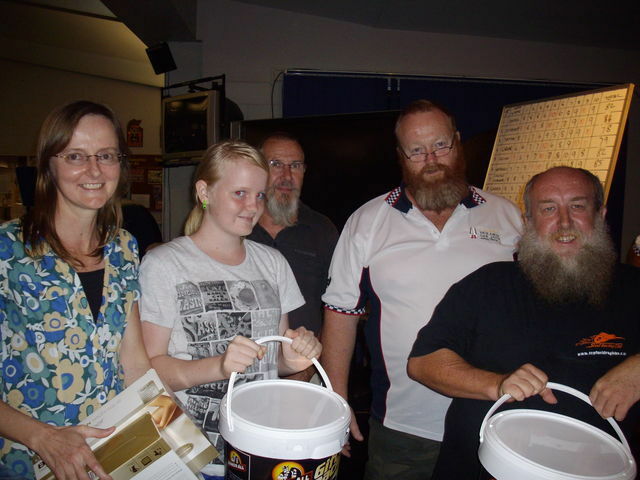 One of the major fundraisers for the club is our Annual "Quiz Nite". Up to twenty tables of six are booked so members need to get in early to get a table. Held at the Pint's Club Marrara snacks are provided by the club throughout the night but many get there early to enjoy a meal before the night begins. 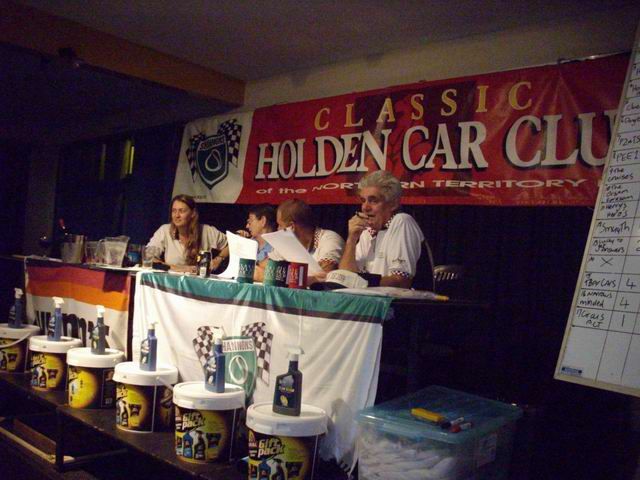 Most of the questions are general knowledge but there is a definite automotive theme. 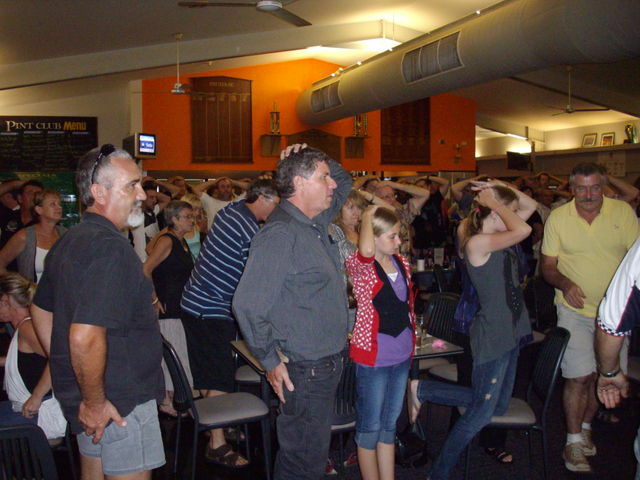 The 'heads and tails' competitions are a hoot and usually there is some Holden memorabilia to be auctioned. This is probably the wettest time of the year for the "Top End" and organising runs can be a little unpredictable due to the weather. 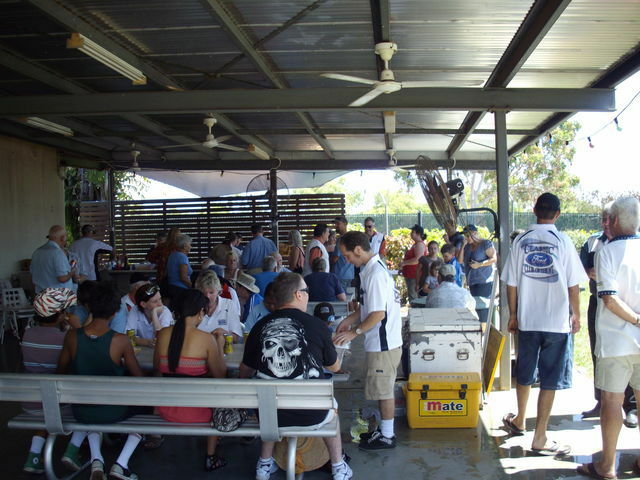 Normally it's a run out of town, to the Adelaide River Railway precinct or Darwin River Dam, its always a lunch at a local pub. As the name suggests NMHD is organised by Motoring Councils across Australia and celebrated in every major centre around the country. 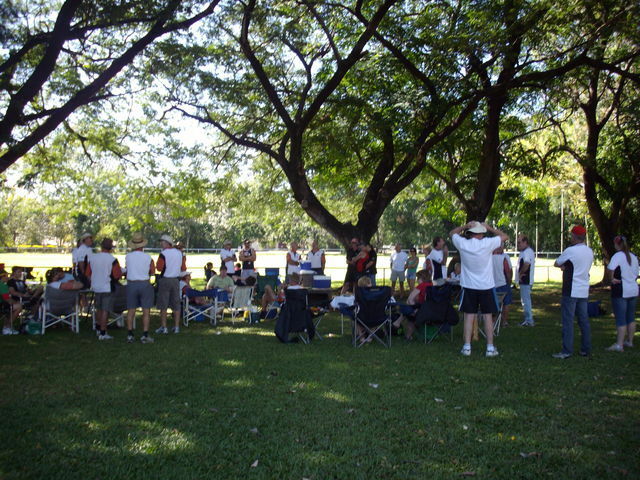 Hosting of the event in Darwin is taken in turns by various clubs, from mystery runs to 'track activities' and it is always an exciting event. Another premier event for the club, it's a chance to show off the clubs best to a crowd of over 40,00 people. 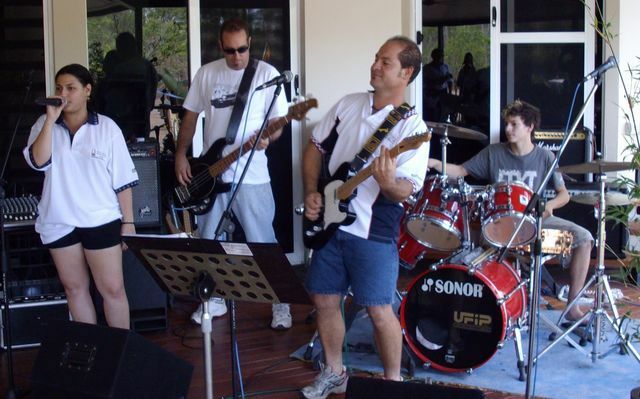 With the exception of 2010 the club has supported this event since 1998. 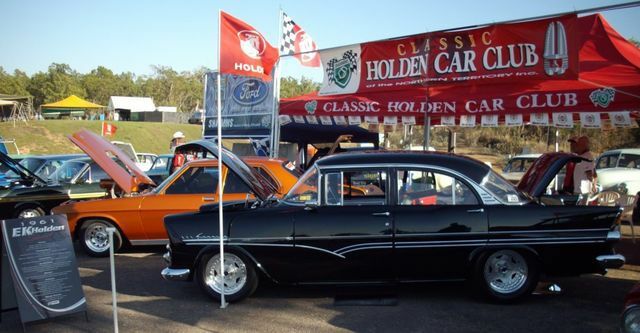 The display highlights the clubs finest and having the marquee set up the club handles enquiries of all things Holden to thousands of enthusiasts. Having the Marquee track side also has it benefits for members as they have a 'home base' to sit back in the shade to watch the action on the track, drinks and food is supplied for free to members over the entire weekend. 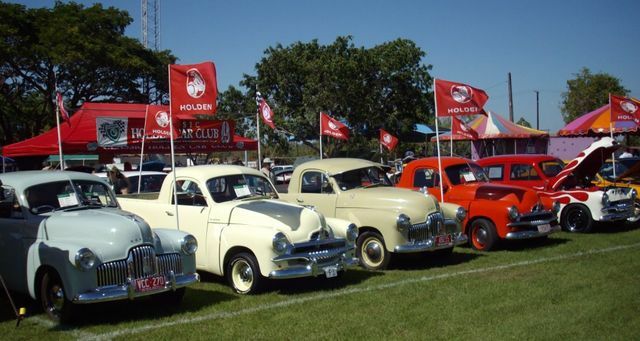 Hosted By Shannons Insurance, the annual cricket match between Motor Vehicle Enthusiasts Club (MVEC) and the Classic Holden Car Club it is held in the beautiful township of Batchelor it is an event not to be missed. 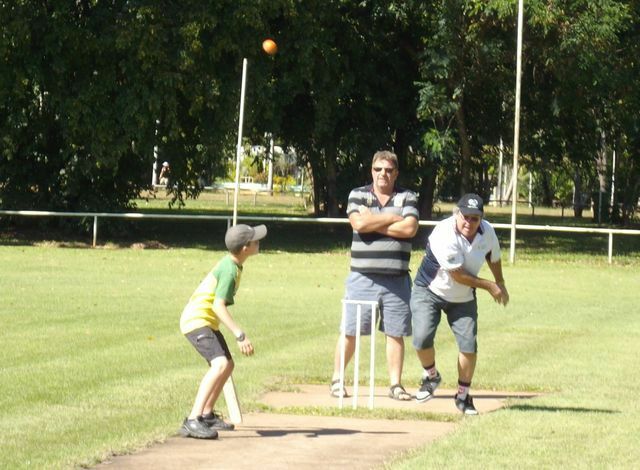 Under the beautiful shade trees surrounding the towns oval it is a hit with players and spectators alike. 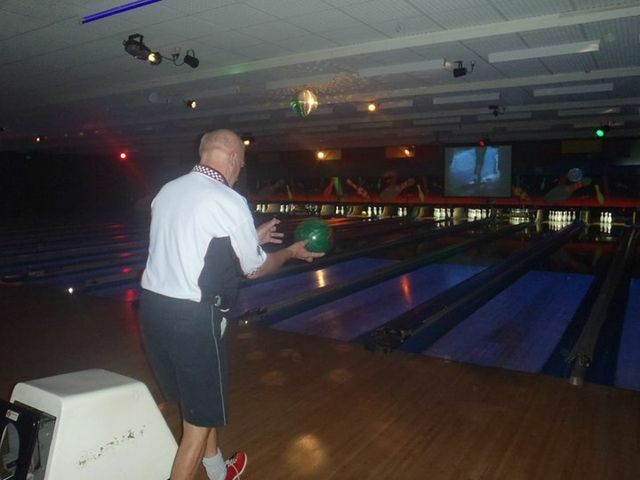 The rules are pretty simple, 8 bowls an over, 20 runs and your out and you can't get out until you have at least one run it is a very social game, some of the older members get their kids to do the running for them. 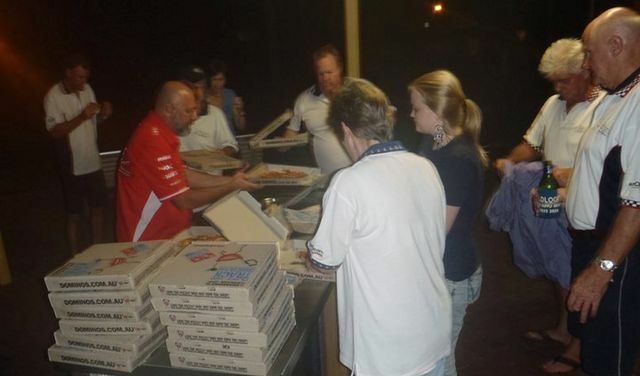 Catering is alternated each year between the clubs. The Picnic day long weekend is reserved for the "City to Souvlaki", hosted by club member Harry Mellios and assisted by the Kyriacou family this is one of the highlight events for the club that's always well received. Starting at the Esplanade it is a mystery run through town and the rural area (around 1 1/2 hours) ending up at Harry's place for a taste of all things Greek. A feast of epic proportions of lamb on the spit and Greek salads and sweets it is something not to be missed. 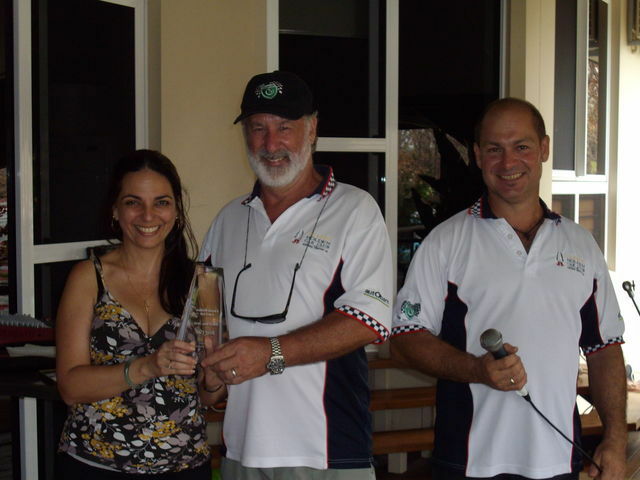 Then with live entertainment and heaps of giveaways including a perpetual trophy for best car judged by Harry's wife Matoula. Drinks supplied by the club. Tickets need to be pre purchased and at $20 a car it is the absolute best value deal anywhere. This the clubs week end away, a camping trip with a difference. Hosted by MVEC Katherine it is one action packed weekend. Leaving United Coolalinga early, its a leisurely cruise into Katherine, we then gather at the MVEC clubhouse (Katherine Museum opposite the Hospital on Gorge rd) where they host a sumptious BBQ. From there it's off to the Car Show. It's a car show that anyone can be proud of with over 70 cars & bikes lined up for judging. After the presentations are done and dusted we head off to fellow CHCC members place Peter & Sandy Balfour for the grand finalle. 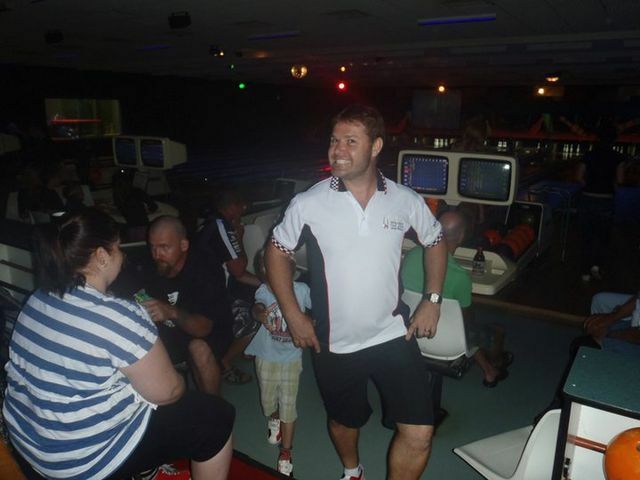 MVEC host a huge dinner and there's plenty of entertainment throughout the night. Camping at Pete & Sandy's is the prefered option, (there's plenty of other accomodation available if you don't want to camp), you can enjoy the ales and not have to worry about driving, and they have 20 acres of beautiful gardens with amenities, it's great camping with the wallabies and wildlife. Sundays a bacon and egg brekky and a leisurely drive back to Darwin. We leave this month open for any suggestions from members, generally it's a run out of town with lunch at a local pub. 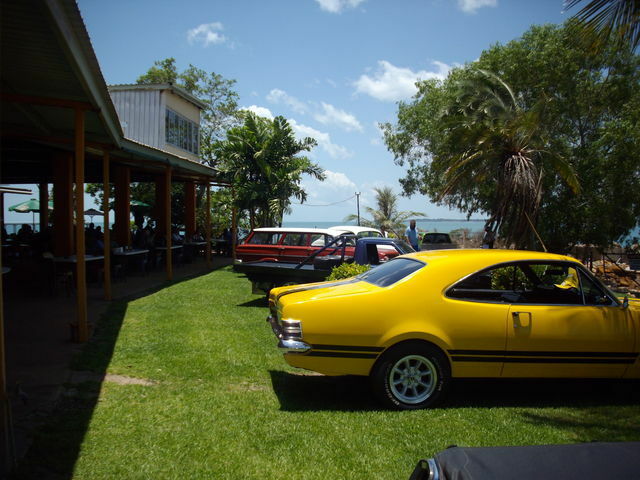 Highly anticipated and well received, the run encompasses a scenic cruise to Mandorah (usually stopping off at Darwin River Dam) for lunch at the pub. 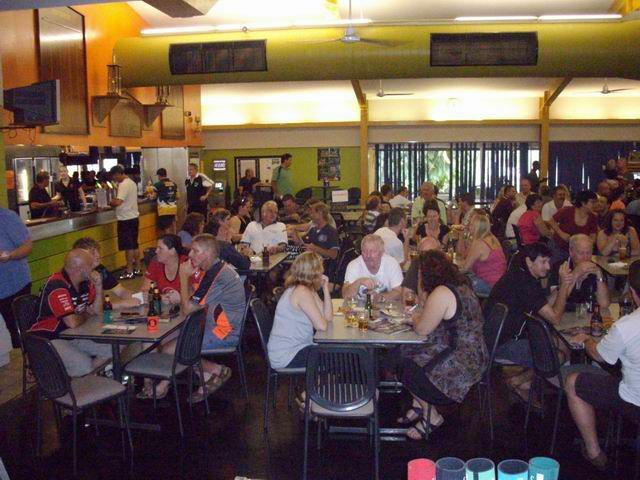 With great views of Darwin from the other side of the harbour, live entertainment and great food it's a hit with everyone.